San Francisco and Berkeley are the only two California cities that made it onto AARP’s list of the nation’s top ten “most livable” cities—San Francisco for large cities, Berkeley for medium-sized ones. 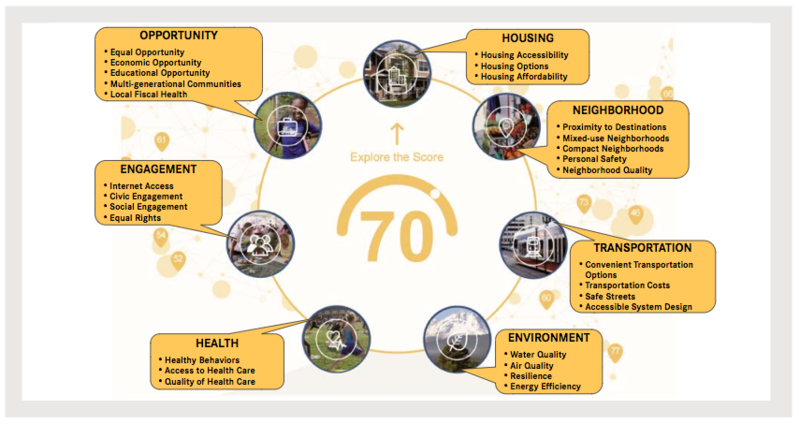 While personal definitions of what makes a city “livable” may vary, the AARP’s “Livability Index” joins many data points into a single number that says something, more or less, about how easy it is to get by in a particular place. It’s maybe not so surprising that San Francisco and Berkeley are high on the list, which measures access to housing and transportation, among other things. But the two cities are also some of the most expensive places in the nation to live, especially in terms of housing—which says a lot about the economic value of livability. But it also reflects a quirk of the Livability Index, which gives a high value to policies that may or may not be felt on the ground yet. Berkeley and San Francisco both score high on the transportation metric, which is measured in terms of transit frequency, average number of walk trips (1.7 per household in San Francisco and 1.4 in Berkeley, compared to the national average of 0.73 per household per day); accessible stations and vehicles, average speed limits, and crash rates (for San Francisco, 3.8 fatal crashes annually per 100,000 people; in Berkeley, 4.4—compared to the national average of 6.8). The transportation metric does not neglect congestion, which it measures based on how many hours per year residents spend stuck in traffic (in both cities, the numbers is 42 hours, compared to a nationwide average of 25.4 hours). That sounds bad—and it’s not great, because congestion slows travel and increases pollution—but it is also a reflection of economic success. In addition, one of the reasons the Bay Area has the transit options it does have is because congestion is bad enough that people recognize it is vital and have repeatedly voted in favor of taxing themselves to help fund it. And although plenty of people drive cars and spend hours in traffic, a lot of Berkeley and San Francisco residents take transit. It’s harder to argue for frequent, high-quality transit in areas where many people are willing to drive long distances, even though not having the transit access lowers the quality of living, especially for people who can’t or don’t want to drive. AARP first launched its Livability Index in 2015. Today it released an update with new metrics, including more detailed data about various criteria that help define an area’s livability. In addition to housing and transportation, those include the quality of the environment, access to health care and open spaces, community engagement, and economic opportunity. The index compares hundreds of cities nationwide, compiling statistics that can give residents and officials a sense of how well they’re doing in comparison to other cities—and how much work there is left to do. It’s a lot of fun to poke around in. You can compare different cities and dive in deep to see what policies and scores your city earns. But it’s not just for fun. The information can be used by local residents and public policy decision-makers to better understand their communities. “It can also encourage people to advocate for livability improvements in the areas that are important to them,” said McPherson. She gave the example of the city of West Sacramento, which used its ranking on the index as a baseline when it joined AARP’s Network of Age-Friendly Communities. As part of that network, she said, leaders commit to completing a community assessment, creating an action plan, and implementing changes over time to become more livable places. There is a lot more information available about the index from the report, as well as the AARP website. it smells like – poop. climb halfway to the stars. Run from the blue and windy sea. Should I come home to you, San Francisco? Your stinky turds and rancid pee? San Francisco offers an incredibly good quality of life, one of the best in the entire nation, if you can afford to live here. With a median age of 31.4 they sure retire early in Berkeley. Not as much as is San Francisco. Median age and fraction of population over 65 are both higher in SF than Berkeley. Well, Berkeley is basically a retirement community, so it makes sense.